"Because there is nothing more important than keeping the memory of our Industry Pioneers alive"
This page will contain those people and thier stories- an 'Online Logger's Memorial' so to speak. the process on the phone, I can call you at your convenience and am very happy to do so; Eric C.
My goal here is to provide a place for the younger generation to learn about those heroes and pioneers who came before. Your contact information will not be shared with any person, agency, or business. I am honored that you would consider adding your loved-one to our Memorial Page, and I will make this as easy as I can for you. We will all be better for hearing thier stories. Without the Pioneers -thier ideas and innovations- where would we be today? 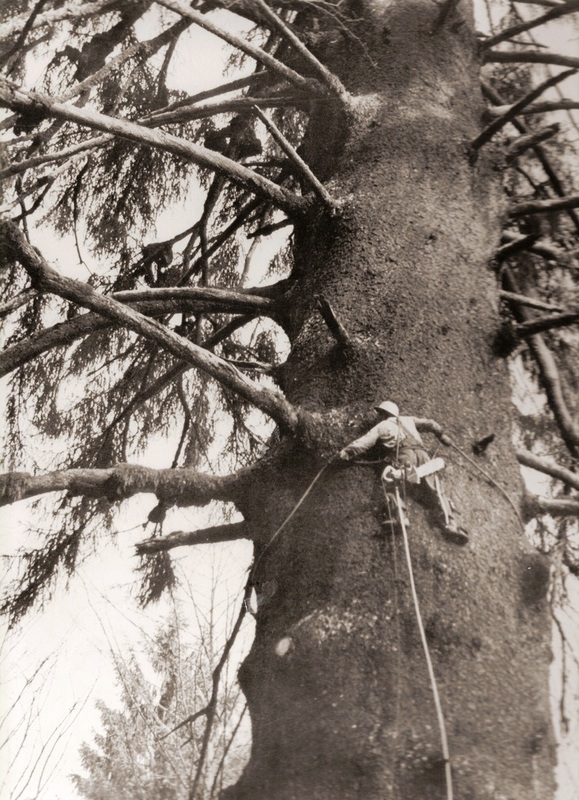 Left: Harold 'Hap' Johnson, limbing his way up a big Sitka Spruce. Hap was my Great Uncle and one inspiration for these Memorial Galleries. The stories of these great men need to be told and retold again.